Weeks after gracing SWIFT’s Sibos conference, rumor began doing rounds that the new SWIFT software upgrade will see the integration of RippleNet and other Ripple based software solutions. It even appeared real after a SWIFT board member left his position at HSBC to go work for Ripple while crypto detectives linked an independent software provider, Temenos, as the company is a partner of both platforms. Typical of the crypto space, the XRP/USD surge was inevitable and it did temporarily flappening ETH to second place. Of course, it would be ideal if we see such kind of partnerships. But SWIFT is having none of it, denying the very existence of the partnership as they revamp their “1998 model”. Nonetheless, SWIFT, as a main player in the global payment system, plans to update their own Global Payment Innovation (GPI) in the course of the month introducing real time, transaction tracking capabilities. Further boosting prices was the media mention that SendFriend will likely integrate XRP once it launches next year. The Fintech startup has the backing of MIT Labs and the CEO, CEO David Lighton is not shy to talk of the advantages of Ripple. In an interview he talks of efficiency and the elimination of FX risks as xRapid transactions settle almost instantaneously. All these and the company’s push to open an office in Dubai later this year combined with White House mentions is positive for XRP. Like the rest of the market, XRP/USD is on a bull runs adding 20 percent in the last week pushing its market cap to $21.5 billion. However, as the market bottoms, XRP prices will likely expand helping drive the total crypto market cap back to $800 billion of early this year. In the last day, XRP is up two percent. Our bullish preview is not because of the last three or days periods of higher highs. It’s all because of the events of late September that saw prices expand 152 percent. Then, XRP/USD raced to 80 cents before slowing down back to 35 cents and rising to spot prices. Because of the bullish break out pattern, buyers are in charge. Encouragingly, accompanying recent higher highs are above average volumes. Even though you can’t compare them with those of Sep 21—751 million, Nov 6 did print higher at 147 million. This is high and above the last 20 days average of 41 million. To reiterate, XRP/USD pair is trading within a bullish breakout pattern with clear supports at 35 cents-40 cents mark. 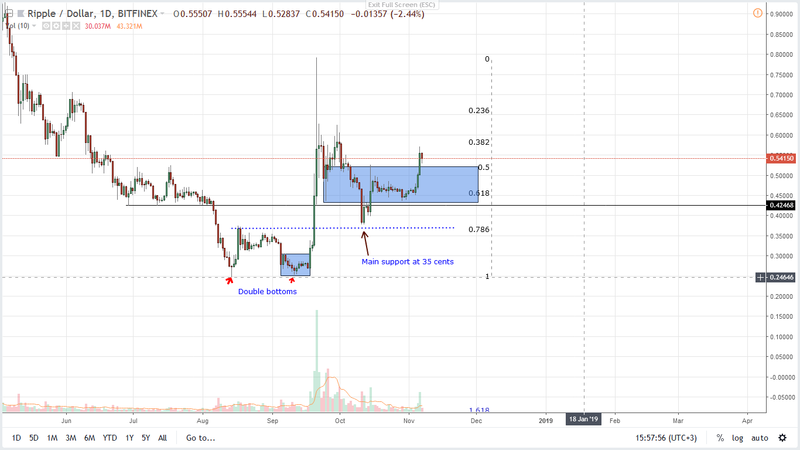 We expect prices to edge higher according to Fibonacci retracement rules as XRP/USD snap back to trend set by late September. Like the rest of the market, XRP/USD is bullish and after surging 20 percent from last week’s close we expect bulls to dominate this week. Therefore, we recommend buying at spot with first targets at 80 cents and later $1. From the way candlestick alignment, safe stop is at 50 cents or Nov 6 lows. The post XRP/USD Price Analysis: SWIFT Integration Rumor, White House Talks Fuel Bulls Aiming at Parity appeared first on Ethereum World News.